Oh, I love Gatsby. Reading this has made me want to go and dig it out of the bookshelf - which is exactly what I'm about to go and do. 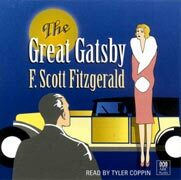 I read Gatsby last year for the first time since the age of 13 - and it blew me away. The writing is so dazzlingly beautiful. And the point of view is so gorgeously refracted. (Sorry, Pseud's Corner for me, with a dunce's hat.) Good to be reminded again of how great it is.